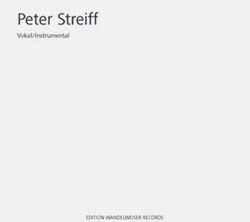 Six songs (1976) for voice, violin, clarinet, piano, cello, harp, and guitar; based on poems by Jean Gebser (1905-1976). The philosopher conveys his core ideas in lyrical language, where form, linguistic rhythm, inflections of speech and mea- ning become an essential part of the musical design. Floating relationships of pitches continue to change from one mode to the next, firmly anchored in their sound universe. The passing of time is crafted only through the pulsating sounds, con- nected through various tempi. The result is music of freely dramatic gestures. Melodies Vol. II (1983) for a reed instrument, version for oboe d’amore. 31 calmly floating monodic figures increase and decrease in length. The composed sound qualities vary throughout the piece in fine nuances. Behind the sensory percep- tion lies a multi-layered system of order based on eleven musical qualities, whose common compositional element is that of symmetry. This order dissolves in time and sound space. Nur allein für deine Ohren (For Your Ears Only, 2011) for voice and baroque oboe/oboe d’amore, based on lyrical texts by eight poets from the 13th, 14th, 16th, and 20th century (in this order: René Char, Anonymus, Dschelaladdin Rumi, Francesco Petrarca, Kurt Marti, Anonymus, Kurt Schwitters, Ernst Jandl). A cycle in two voices and 14 parts. The texts of the short to very short pieces are inspired by the ambivalence of love poetry and spiritual allusion. The 14 texts progress from mediated meaning to speech sound free from meaning. Zeitstrahl (Beam of Time, 2010) for aulos, a double-piped instrument, with both pipes tuned to the same pitch. Tireless research and creative productivity of musician Conrad Steinmann and instrument maker Paul Reichlin brought the instru- ment back to life. It now challenges the artistic powers of composers with its qualities and (as we see it today) radically limited possibilities. 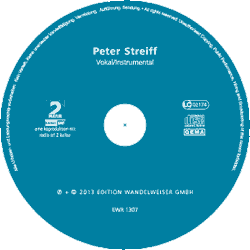 Studie (Sprachzeichen) (Study / Speech Signs, 1978) for six violins. The piece Fermaten (Fermatas, 1971-72), a very long monodic line, develops into the electro-acoustic music Nachtgedanken (Thoughts at Night, 1975). Overtones in high pitch emerge from the dark deep polyphony. Six different bow strokes of the violins contrapuntally lengthen the sounds into sound colors. Ohrspuren am Drittelberg (Ear Traces on Third Mountain, 2008) for third and semitone grand piano. The piano in third tone tuning goes back to the development of Mexican composer Julián Carrillo (1875-1965). The combination with a traditionally tuned piano produces third and sixth tones in addition to the familiar semitones. The composition explores this constellation of 116 tone pitches and yields them to the ear. im Worte: ich habe dich lieb. Immer muss man zueinander reifen. Alle schnellen Dinge sind Verrat. nur dem Wartenden erblüht die Saat. erst den Keim und dann den Garten. Was wir wissen, ist gering. Was das Herz weiss, ist sehr viel. ists des Schicksals ernstes Spiel. singt dir still das Liebeslied. Car je laisse mon ame a fin qu’elle vous suive. Amour me fait mouvoir par son feu vehement. Que n’avez rien en vous qui n’y soit vivement. Qui refraichit ma pert’, et l’en fait souvenir. Et que vous ne veuillez avec vous le tenir. a rallegrar de tua vista consenti ! di te piangendo no, ma de’ miei danni. a l’ andar, a la voce, al volto, a’ panni. Ivganzito oti un vana vea paga gu zogoto. Un facva gon vonocaqua vo tugavva i doc rafa.